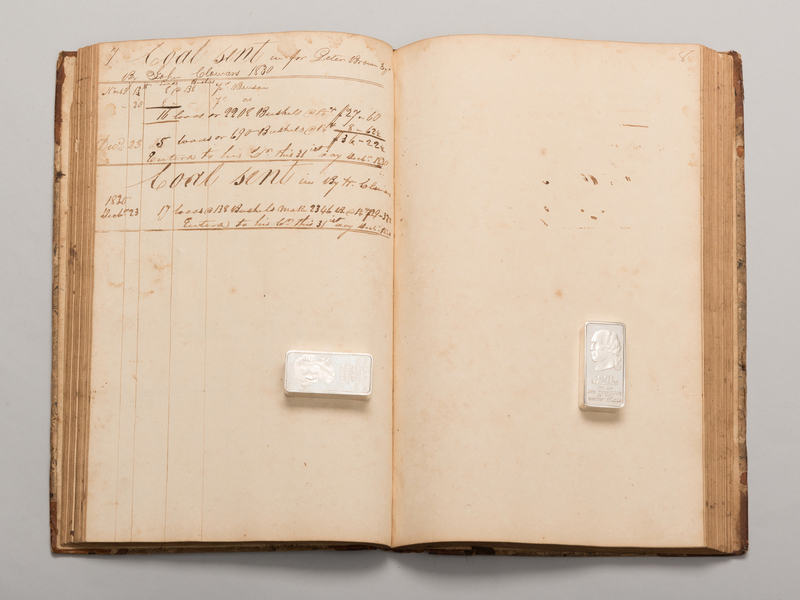 Ledger related to an early Greene County Tennessee furnace and pottery, 1820s, plus a doctor's ledger and various ephemera. 1st item: "Potters Book for the Blast of 1829 and Smyth", leatherbound ledger with marbled boards, with a list of 14 potters on the front page: Stephin Parsons, James Ellis, William Griffith, Issac Hickey, James Small, Edgar Kelso, William Raulston, Calvin Raulston, Jefee Bowles, John Baldau, Robin Black, Hewey Baldwan, Issac Hickey [listed twice], and James Shaw. 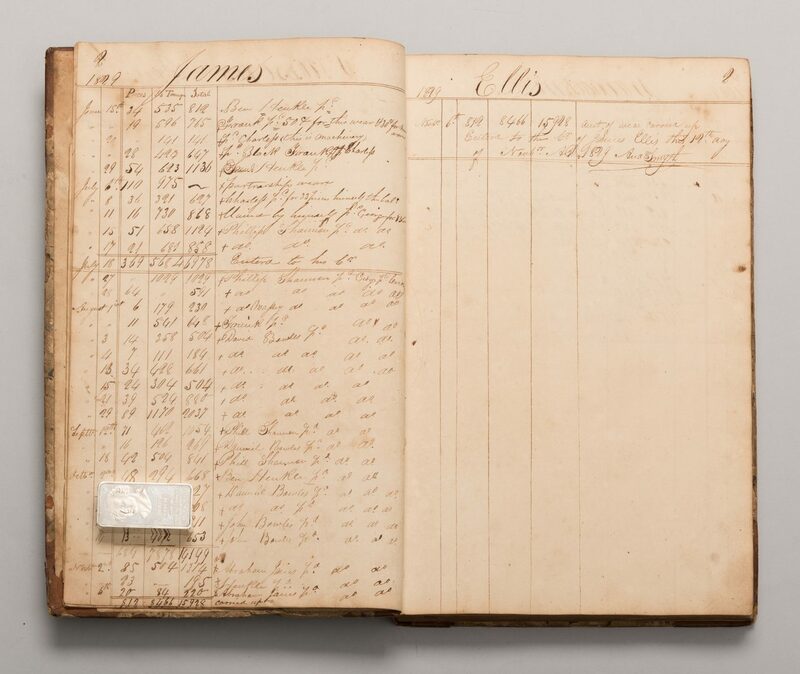 Subsequent pages have columns for date, price, tonnage, total, and additional information. The ledger also contains additional potter information for 1829-1830, with names David Warden, John Ferguson, James M Miller, Jerry Lamerson, Issac Hickey, James Wardon, Hudson Luttnell, John Danicly, Hiram Hogan, Bryant Deaton, John Gragg, Andrew Horguson, Raulston Mitchell, Robert McDornet, Jefee Bowles, William Horguson, and Stephen Smith. 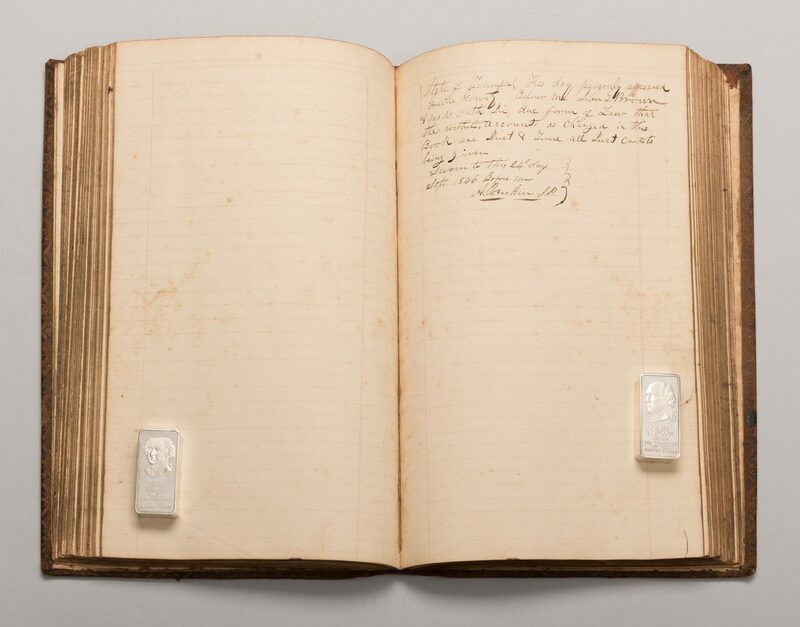 Ledger also includes information on "Labourers Mechanicks" "Coal Sent" and other operations, giving a glimpse into the daily operations of a pottery making molds for a Greene County furnace. 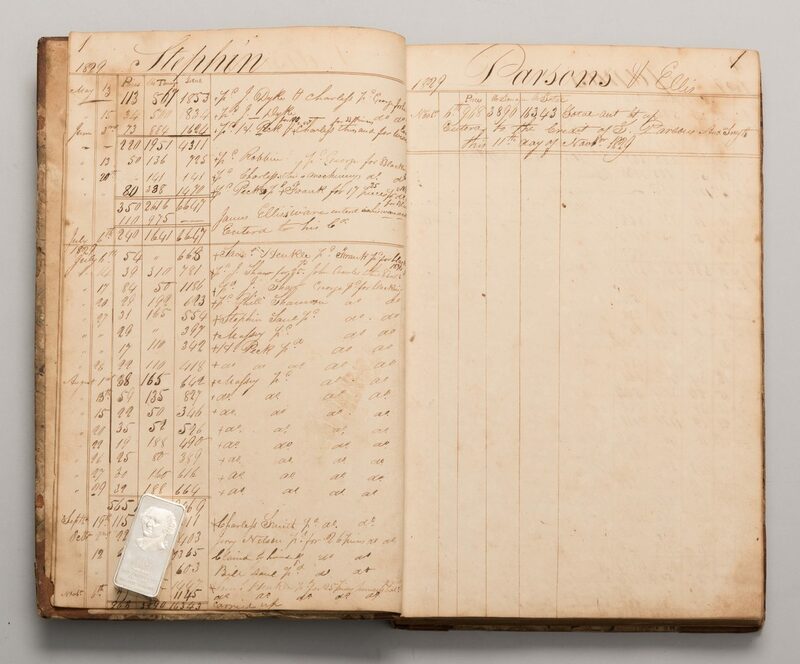 Immediately after the potter records, the book contains records of bushels of corn sold from February 1st 1887 to November 1888 and corn and wheat records dated April 24 1899, suggesting the book may have been re-used for other purposes later in the century. 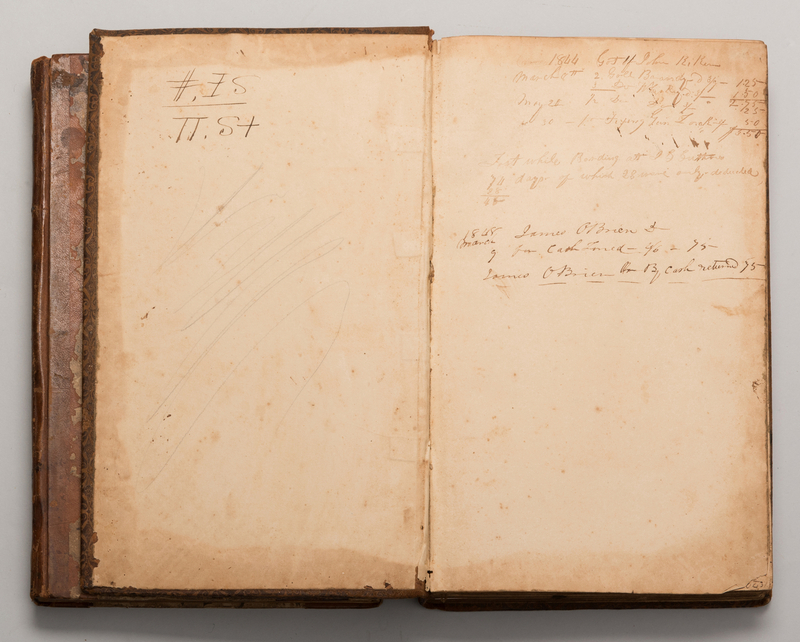 2nd item: Leather hard bound Day Book ledger with tooled covers that begins with the documentation of purchases made from a general store in Cedar Grove, TN from October 2nd, 1826 to October 6th, 1829. Record of purchases include the information such as the name, item purchased, and price paid, for example "AG Rambo 1 Gallon Whisky 75" under the underlined date Dec 1st, 1826. 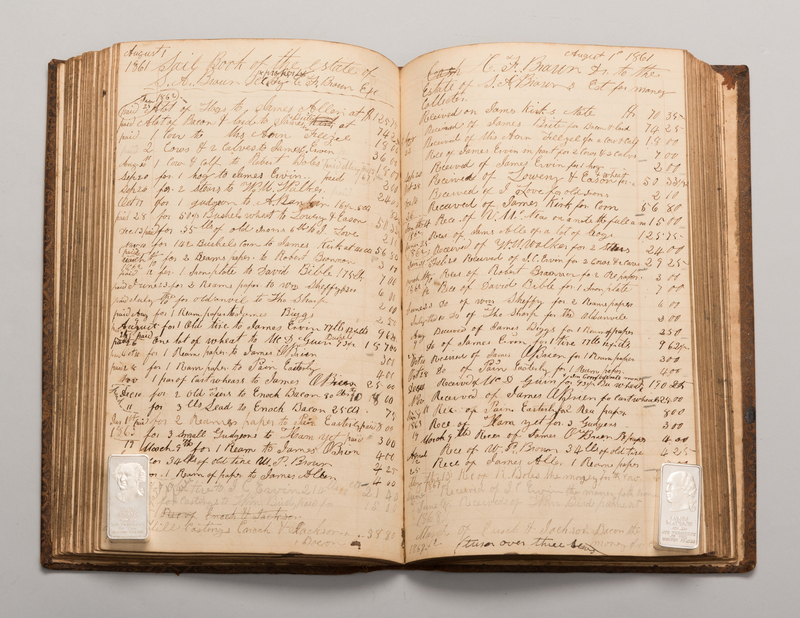 The middle section of the Day Book includes the record keeping for Doctor John G. Brown from April 8th, 1842 to October 24th, 1848, documenting the patient's name, reason for visit, and price paid, for example "William Smith…for 1 visit and medicine to lady…1.25" beside the column labeled May 10. 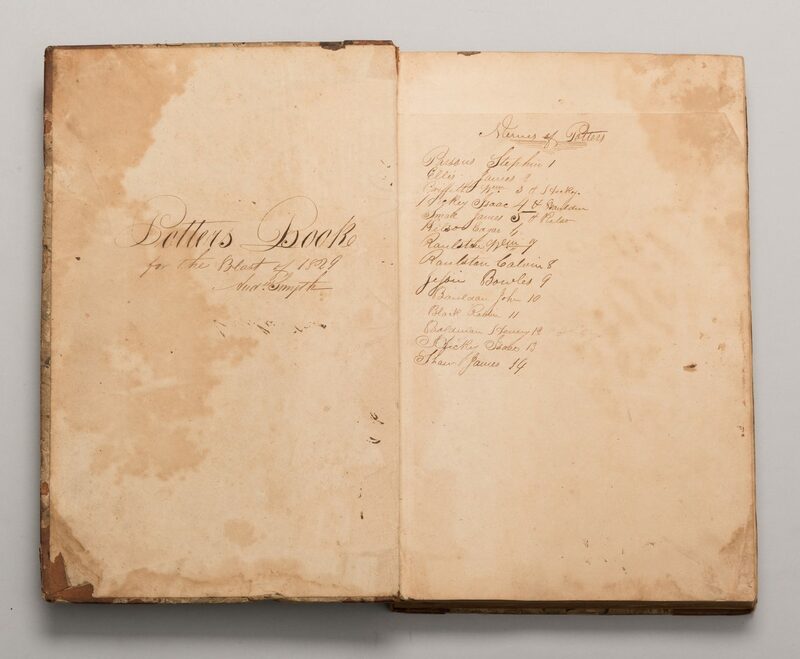 The later section of the Day Book documents information related to the estate of Doctor Brown and the last page includes a record from the general store dated September 15th 1827. 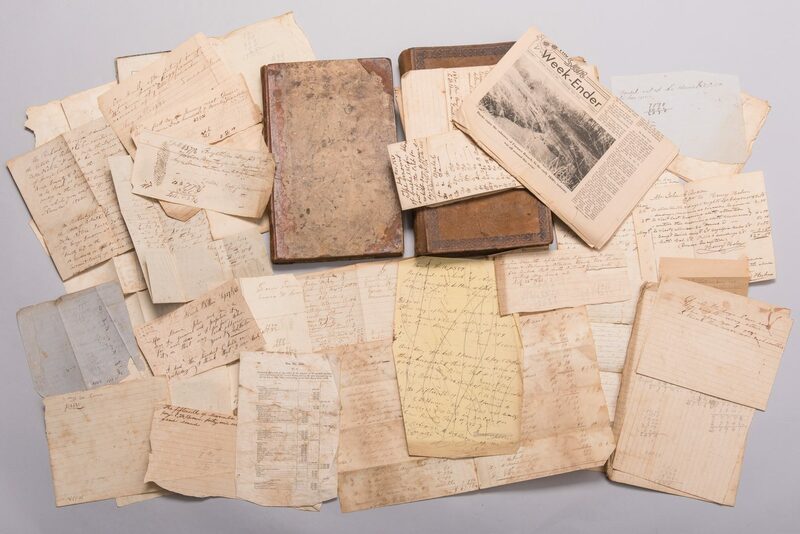 Also included with this lot is a folder containing assorted ephemera from the same estate source where the ledgers were found, including a letter written by Doctor John G. Brown. The letter was written from Cleaveland [TN] and dated Thursday March 22nd 1847 and addressed to his mother, Mrs. Sarah A. Brown Little Chucky, Greene County, E Tn, in which he speaks of his health and his acceptance by other physicians in the community, and advice to a woman named Tamra to "live on light diet and I expect it would be advisable to get Bleed". 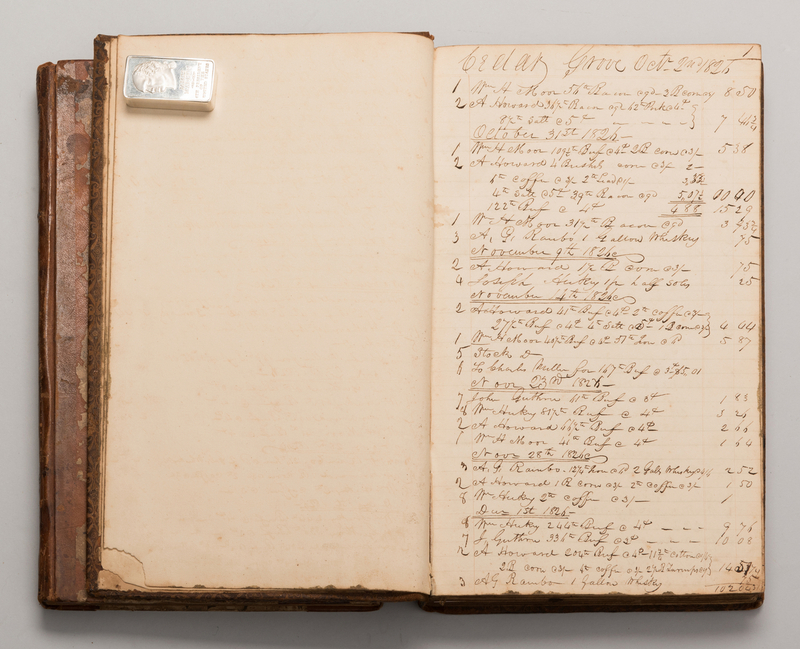 Also included are various promissory notes, mathematical notations, and more. 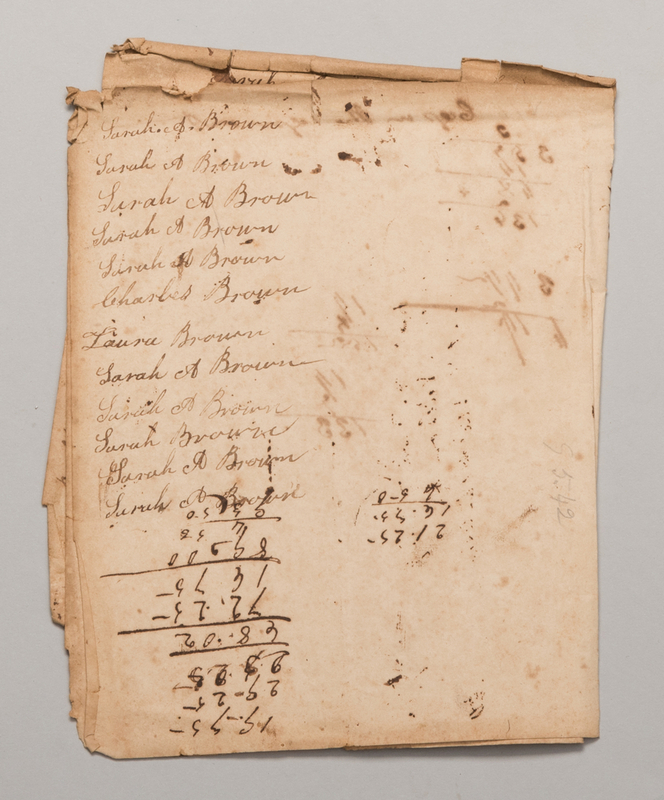 First Ledger – 12 1/4" H x 8" W x 1 1/8" D. Second ledger – 12 3/4" H x 8" W x 1 1/2" D. Provenance: All acquired from the estate of Harry Brown of Western Greene County, Tennessee. 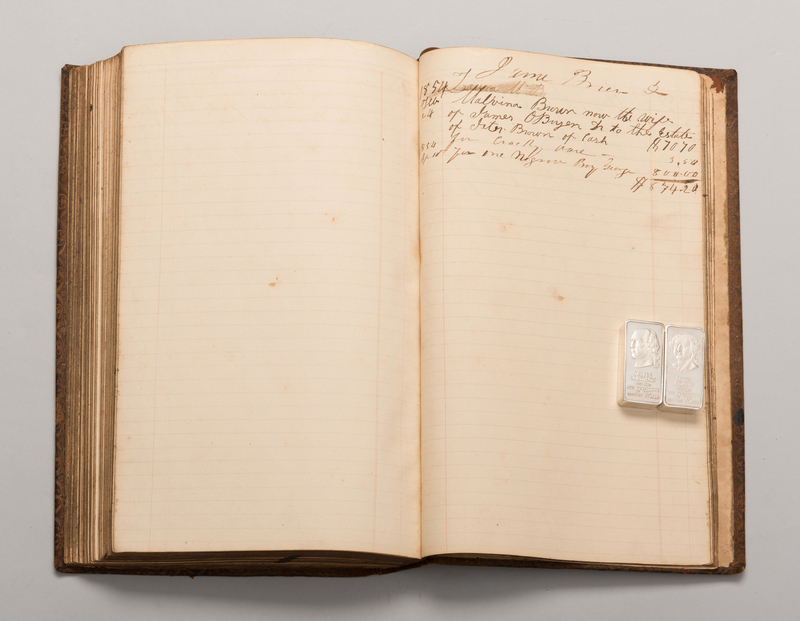 According to family history, Brown's ancestor immigrated from Scotland to Greene County via Ohio (using the Melish Traveller's Directory, also offered in this auction) and established a pottery making molds for the iron industry. 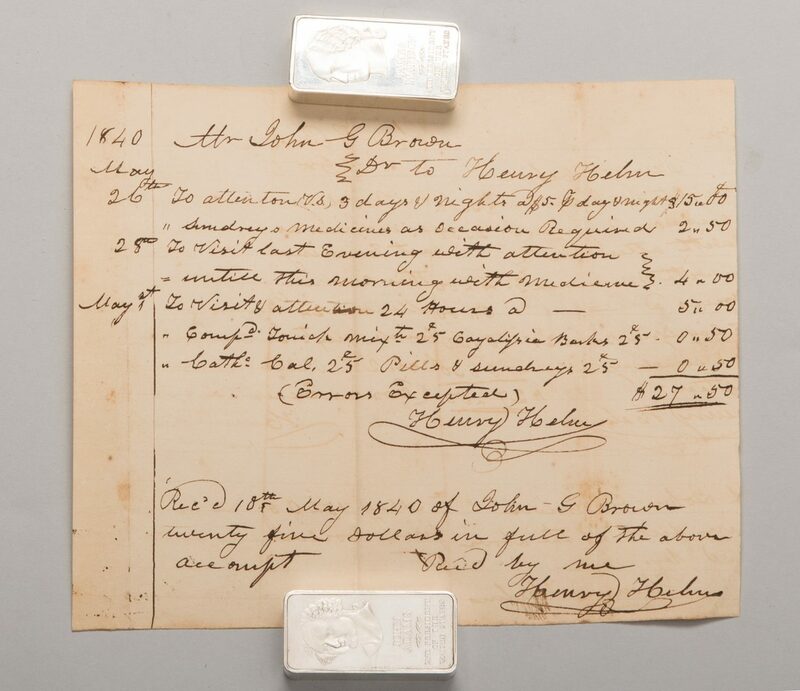 A Civil War letter from Dr. Brown, who served as a surgeon during the conflict, is also in this auction, lot 234. CONDITION: Ledgers in good condition with wear. Spines are intact. 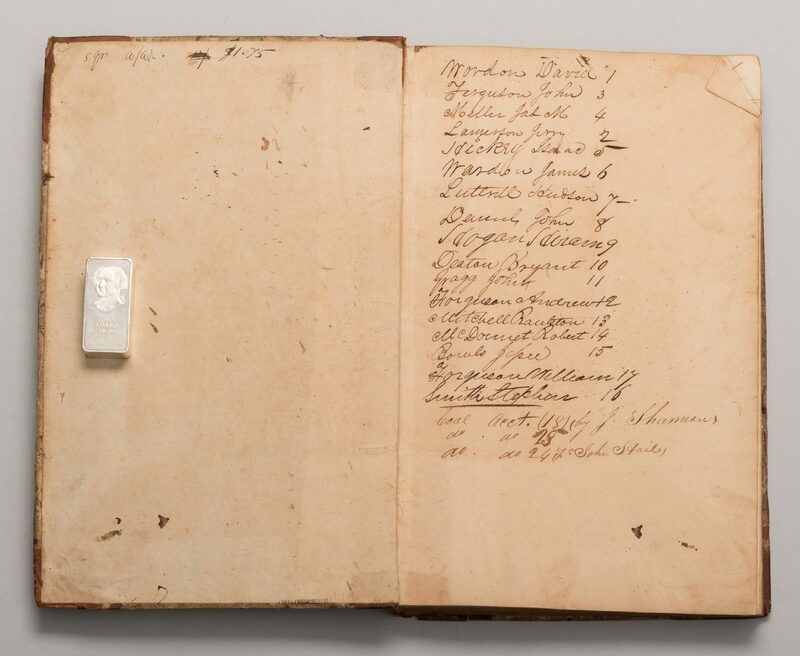 Pages still attached to spine and all are present. Pages exhibit light toning and foxing. All loose items with some foxing and toning, and scattered edge losses.